Successfully Added Quad Band Touch Screen Cell Phone - Dual Sim and Dual Standby to your Shopping Cart. 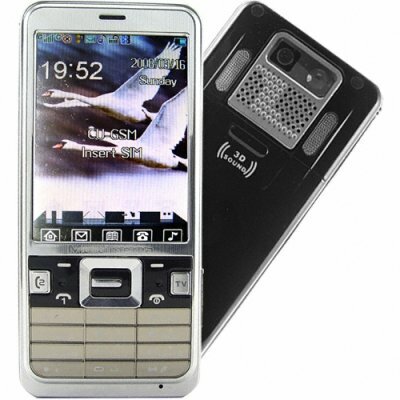 Worldwide use quad-band (850MHz, 900MHz, 1800MHz, 1900MHz) dual SIM bar style touchscreen cell phone. This fantastic new model has a keypad with extra big keys, a breathtaking 2.8 inch QVGA display, and a motion sensitive game feature for additional fun. This bar style cellphone really is one of a kind. It features a genuine stainless steel casing, providing excellent weather protection while at the same time giving a beautiful contrast to the 2.8 inch screen, making it that much easier to view pictures and videos. In addition, the keypad has big keys that are backlit with colored LED's and have a mirrored finish to give additional style to the mobile phone. Is this a mediaphone? Yes, it has a nice touchscreen navigation and color icon menu system that allows you to easily get to the media features, including TV, FM radio, MP3 and MP4 players, digital still and video camera, E-Book reader, videogames, and picture viewer. The two SIM cards are both available for calls (dual standby) and have advanced security and call settings to maximize your efficiency from each phone number. You can also use the "Call Secretary" feature to have your own phone based recorder for incoming calls. Also available for either SIM are a WAP browser and robust Bluetooth features. This is a simply a great cellphone that smartly designed today's most useful mobile features into a well designed package. A good choice to feature on the front page of your online store. Available for selling either stock quantity or drop shipping sales. Proudly brought to you by the leaders in wholesale direct from China electronics, Chinavasion. Quad-band 2.8 inch touch screen cell phone with two GSM/GPRS SIM card slots for worldwide use. Features all of todays most popular media features as well as a WAP internet browser. Easy to use keypad with large keys that are backlit in color. Motion Dice Game - shake the phone to roll those bones! This phone is full featured, tv, radio, video player what more could anyone want?